I read this book to some classes with lots of wriggly, hot and bothered boys today and it was perfect. Everyone, both girls and boys, had stories to share about everything to do with building, construction, their experiences with people who wear fluro safety vests – most kids had some sort of experience with home renovations and some lived in suburbs where new public library buildings had recently opened. We talked very conversationally about our library building and the differences between a school library and a public one. Sometimes I really enjoy the library read aloud sessions where it is a little unplanned and casual, and we end up having open conversations. Both of Sally’s books in this series (Road works and Demolition) were checked out after this one was read and both by girls! 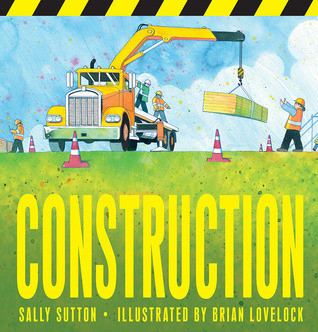 Construction / Written by Sally Sutton and Illustrated by Brian Lovelock. Published by Walker Books, 2014. Two years ago I wrote about a wonderful new book that I had recently purchased for my school library written by Tom Palmer and published by Barrington Stoke. That book was Scrum, and two years later I am still heartily recommending it to my students. Tom has gone on to write other great sports books for Barrington Stoke and we have purchased every single title for our collection. The success of these books with my mainly struggling boy readers encouraged me to buy more Barrington Stoke titles including many titles with more ‘girl appeal’. The benefit of these books are three-fold : the books are dyslexia friendly without looking like they are “special”; the books appeal to struggling readers or those needing hi-lo material, as well as those kids that just don’t like reading but are more likely to pick up and try a short book; lastly and most importantly, the stories are so well written and so good that they appeal to readers of mainstream fiction as well as dyslexic and struggling readers. 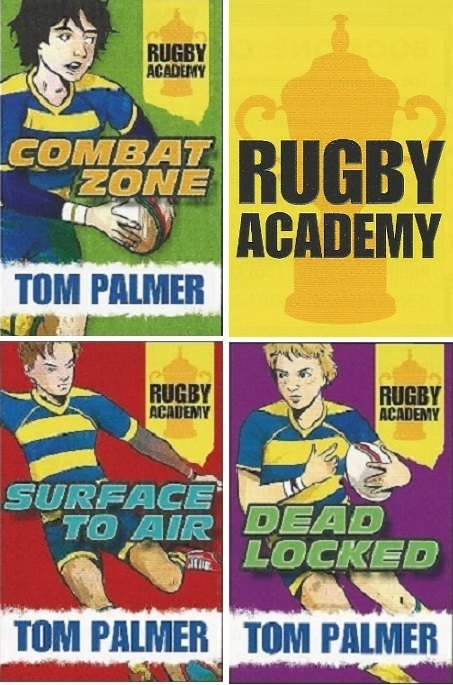 I was really excited when I learned that Tom was writing a series for children with a Rugby theme. Despite living in a rugby mad country like New Zealand, there really isn’t enough children’s fiction written and published that connects younger readers with their sporting and other interests. The first book in this planned trilogy is ‘Combat Zone’ set in England, the second book ‘Surface to air’, set in Toulon France, is due out in February 2015 and the final book ‘Deadlocked’ is set in New Zealand!!! and is due mid-year around the time of the 2015 Rugby World Cup. Publisher’s description: “Borderlands is no ordinary school. All of the students boarding there have parents in the armed forces, and the UK is drawing perilously close to war in the Central Asian Republic. “Sort of a children’s World Cup to run alongside next year’s Rugby World Cup. The reason for the titles of the books gives away the second theme to the series. The Royal Air Force. Most of the boys in the Borderlands team have parents in the RAF. The series is set during a conflict a little like what is going on now in Syria and Iraq. A sad coincidence, I’m afraid. What did I think about Combat Zone? I loved it. I think the three main plot elements ( the struggle to switch from playing football to Rugby Union and the hardships of being sent to boarding school and coping with the worry of a family member fighting in a war) mean that the story has plenty of action and angst. That is perhaps the aspect that makes me like this so much – it isn’t “just a sports story”. The reader may pick it up because of the hook of a story about rugby, but they are exposed to a lot more – the same empathy inducing plot that they would find in realistic fiction combined with a great sports story! Every time I read one of these books I am amazed at how the power of the story shines through, even if it contains far fewer words and chapters than the average book for the same aged reader. The author makes every word of the text count. There must be an art to this – how to tell a story using very spare prose? It is certainly something this author does very well and why I am eagerly awaiting the next installment in the series. These books fit perfectly in our newly genrefied sports fiction section. Rather than have them in a collection of dyslexia friendly books, as we have done previously, they are shelved with the other sports titles. Should I need them for a dyslexic student they are easy to find, but they can be read by any reader at any time. As I have said previously – the stories are so good, the dyslexia friendly format is a bonus! This PDF file helpfully shows you the special yellow paper and dyslexia friendly font used in the books. Published by Barrington Stoke, 2014. NZ RRP $17.99 If not in stock at your favourite independent book store most would be happy to order this for you. A ninja must be strong, courageous, and silent! He creeps through the house on a secret mission. There may be obstacles! But have no fear—a true ninja can overcome all challenges. 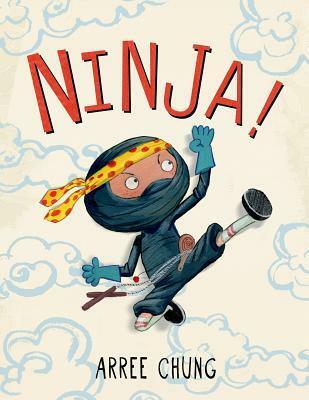 Ninjas are hugely popular with kids, both girls and boys. I believe that if we want to grab and keep the attention of kids, especially boys, and convince them that reading is fun, then we have to start showering them with books when they are small and we have to offer books for them to choose themselves that feature the kinds of characters and stories they want to read or hear. Some of my youngest clients love anything ninja from Lego Ninjago first readers to Gareth P. Jones fab series Ninja Meerkats. This is both cute and clever. I can remember my own children delighting when they thought they were being stealthy and I couldn’t see what they were up too. It’s like that for readers with this book. The main character, Maxwell, is acting out his ninja fantasy trying to steal the cookies when the reader can see that his sister is well aware of exactly what is going on. I love the format of the story which is almost comic book or storyboard in some pages. All we can see of Maxwell, is his body language and his eyes – and these really tell us what Maxwell is thinking and feeling. I can imagine this as a movie – in the meantime make do with this cute short film! I hadn’t bought this book for our collection but it was recently announced as a NPR Book of the year for 2014 and featured on a multitude of ‘best of lists’ from review sites and reviewers I admire. I decided that was reason enough to borrow a copy from Auckland Libraries and assess whether to add this to our PB collection. Barrington Stoke produce high quality, high interest books for struggling readers. They also produce books that are ‘Dyslexia friendly’ – the font, printing style, page color, length of paragraphs and chapters are all designed for successful reading. This one is tagged Interest age 8-12, reading age 8. One boy, two codes … How will he decide? When Steven’s mother remarries and moves down south, Steven is torn between loyalty to his dad and a relationship with his mum’s new husband. Maybe even worse, he might have to leave his beloved Rugby League behind for a new Rugby Union team. What do I think about this book? Confession 1: Although I live in the greatest Rugby Union playing country in the world.. I don’t follow rugby that closely and I certainly have no real idea about the differences between League and Union – however after reading this book I learnt quite a few things about the codes and the differences between the two. Confession 2: I would never normally choose and read a sports book… but I read this one quite avidly and found the story really moving (I had a little tear at one point when I could sense Steven’s frustration with his Dad and the choices he had to make.) Surely a sign of great writing if all of this comes across in a 75 page short book! We have recently purchased Tom Palmer’s Football Academy series and will be getting all his other books for our library collection. Tom is a very generous author – he puts a lot of time into promoting reading, please check out his wonderful website – link below! I am so impressed with these publications that all of the copies in my library have been tagged and put into a section of short/easy/fast reads for my struggling readers (both girls and boys) at year 5/6 level, those with dyslexia, as well as the boys that don’t like reading fiction (these boys will try these sorts of books because they aren’t too thick and the size is ‘just right’). Having these books together in one place has been a hit with our special literacy groups as it reduces the angst the students feel when fruitlessly perusing the shelves for something to read. I believe in making things easier for these kids, but am doubly motivated when I can see they are more successful and their level of frustration is substantially reduced. I had previously written about Gamer by Chris Bradford (also published by Barrington Stoke) – after reading that book and being so impressed with it, I decided I would have to seek out more from this publisher. What I love about these books is that they are really well written and are good stories that kids WANT to read.The high interest topics are age appropriate and importantly the covers look like those of mainstream books, not something that marks the reader out as being in a special needs group. These books are so well done, that readers of average ability, would be happy to read them as a quick read. Barrington Stoke have a wonderful selection of authors writing for them including Michael Morpurgo, Jo Cotterill, Tommy Donvaband, Chris Bradford, Karen McCombie, Jeremy Strong – something for every taste. These books are wonderful for kids wanting to be seen to be reading the same authors as their peers. There are many sports books recommended for boys, and sports books are highlighted as a hook for reluctant readers. The problem for me is that a lot of these are American and kiwi boys don’t play or understand American Football and Baseball. Basketball is OK – as it’s very universal, as is Football/Soccer. It is great to see a book with Rugby as the theme as many of my students play the sport. I hope Tom will write more like these. If I can get boys reading these sorts of books there is always the opportunity to ladder them onto other great sports fiction, even if it is about baseball (e.g. Mike Lupica) because once they are confidently reading then they will be happier to explore other titles and will be able to see the parallels about striving for success, acceptance and identifying with the characters no matter which sport is the subject of the story. Ash Mistry is leading a pretty complicated life. There’s school, his unrequited crush on girl-next-door Gemma… and then there’s the fact that he’s the reincarnation of the great Indian hero Rama, not to mention the small detail that he died last year, and came back as an agent of the goddess of death. So when the demon servants of the evil Lord Savage come after Gemma in order to get to Ash, you’d think he’d be ready to take them on. What do I think about this sequel? This book is fantastic – if anything I found this even better than the first – it’s tighter and expertly paced. Kids that love rip-roaring-seat of your pants adventure will LOVE this: it’s got villains trying to stay immortal but young again, the hindu version of Goloms, demon shark monsters, betrayal, redemption, loss, friendship – but mainly action. This would make a fantastic movie. My only note of concern….once again publisher’s age recommendation is 9+. This is very violent with LOTS of killing – I recommend this for MATURE 10+ and I would be warning kids/parents/teachers as I talk about it with them. The violence didn’t worry any of my readers of the last book (Ash Mistry and the Savage Fortress) as it does seem ‘in context’ with the Hindu myths and legends and also the belief in reincarnation (and Karma). Even so, I don’t want any of my students having nightmares. I loved this – it was awesome! Navigating early by Clare Vanderpool. At the end of World War II, Jack Baker, a landlocked Kansas boy, is suddenly uprooted after his mother’s death and placed in a boy’s boarding school in Maine. There, Jack encounters Early Auden, the strangest of boys, who reads the number pi as a story and collects clippings about the sightings of a great black bear in the nearby mountains. Newcomer Jack feels lost yet can’t help being drawn to Early, who won’t believe what everyone accepts to be the truth about the Great Appalachian Bear, Timber Rattlesnakes, and the legendary school hero known as The Fish, who never returned from the war. When the boys find themselves unexpectedly alone at school, they embark on a quest on the Appalachian Trail in search of the great black bear. But what they are searching for is sometimes different from what they find. They will meet truly strange characters, each of whom figures into the pi story Early weaves as they travel, while discovering things they never realized about themselves and others in their lives. What did I think about this book? I LOVED THIS BOOK and thought about it long after I had closed the pages. The writing is beautiful and there is depth in the plot and characters…but I wonder if the story could have been developed even further and possibly published as an adult novel? This is a tricky review to write and I am thinking about how hard a “sell” this might be to my students (My oldest are Year 6 – equivalent to 5th Grade in the USA). So many books these days have action from the start and many readers rely on that to get them hooked. Part of my role in developing readers is to get them to see the value of a strong build up in a story i.e. getting to know the characters, the setting, the back story – before reaching the action. I know that there will be students in my school community who aren’t mature enough readers to persevere past the first chapter or two. I found the start slow and whilst I am well aware that “good things take time” my reading enjoyment was punctuated with fears about whether or not I could get anyone to read this. Once Early and Jack have left the school and are on their adventure, the pace picks up considerably and there is action and adventure aplenty. Unfortunately it’s almost too much happening too soon and so many dangerous and unsettling things happen in quick succession. Whilst the action and adventure ties in with the parallel story about pi, it did stretch credibility somewhat. Zac Harding introduced me to the work of New Zealand author Des Hunt in this post. I bought the book on his recommendation and read it in an afternoon – it was really exciting, well paced and beautifully written and really was one of those stories I couldn’t put down until finished. I have a selection of books by Des Hunt in my library and had not read any of them – so I am really grateful to Zac for having introduced me to his books. Now that I have read this one, I will be offering these titles to the Year 5/6 students who prefer realistic, adventurous fiction over fantasy. It seems only fitting that I reblog Zac’s original post! Zac is interviewing a wonderful selection of New Zealand authors and illustrators, as well as reviewing some great NZ titles during NZ Book Month so hop over to his blog to read more! In Phantom of Terawhiti there are references to the ethics of keeping wild animals in enclosures. This could be a good topic for a class debate. Harper Collins has provided PDF notes for teachers here that include links to web resources on this topic and much more! Des Hunt is one of my favourite New Zealand authors because he writes action-packed adventure stories set in New Zealand. The setting is always so important in his stories and Des has introduced Kiwi kids to parts our beautiful country that are both familiar and unexplored territory for them. In his latest book, Phantom of Terawhiti, Des takes us to Wellington’s wild southwest coast and introduces us to Zac, who stumbles on an interesting discovery. Enter your email address to follow this blog and receive notifications of every new review by email. Why can’t I buy [insert title here] as an ebook?